Few of the prominent players in the worldwide thermal imaging market comprise Danaher, FLIR Systems, Drs Technologies, L-3 Communications Holdings, Inc., Bullard, Raytheon, Axis, BAE Systems Inc., Sofradir Group, Thermoteknix, CI Infrared Cameras, Inc., Testo Ag, Honeywell International, Inc., Nippon Avionics Co. Ltd., and Infratec. 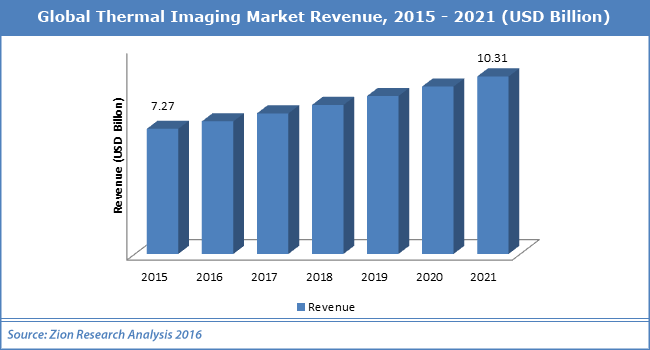 As per the report, the worldwide thermal imaging market was esteemed at about USD 7.27 Billion in 2015 and is anticipated to produce an income of USD 10.31 Billion by 2021 end, developing at a CAGR of somewhat over 6% between 2016 and 2021. Thermal imaging cameras are utilized across the broad array of industries comprising automotive, medical, defense, industrial, aerospace, and much more. The thermal imaging market is majorly fueled by demand from commercial & industrial sectors and the rising security, automobile, ad surveillance industry. The growing need for thermal cameras in smartphones owing to reduced price is projected to drive the global of the thermal imaging market. Nevertheless, lack of wakefulness and decreased defense funds in developed regions might hamper the expansion of thermal imaging market. However, the rising need for thermal imaging services is anticipated to open new growth avenues for the thermal imaging market in the near future. The thermal imaging market is diversified based on diverse components into hardware, services, and software. The hardware segment was the biggest segment of the thermal imaging market in 2015 and accounted for the biggest market share. Thermal imaging market comprises the application such as maintenance & monitoring, healthcare, surveillance & security, traffic monitoring, automotive, and others. By end-user, defense and military segments governed the o thermal imaging market in 2015 with above 45% stakes of the overall market. Industrial was the 2nd biggest application segment of the thermal imaging market. However, the industrial and residential segments are also anticipated to display significant growth in the near future owing to the accessibility of low-cost devices. The stipulation for thermal imaging was maximum in North America in 2015 with about 30% share of the market. In terms of demand, North America was followed by Asia-Pacific and Europe, while Asia Pacific was the rapidly budding region in terms of revenue. According to a September 2018 report, Apple is functioning to enhance the abilities of computer vision to make it identify and detect objects more precisely, such as in settings where both the subject and the camera are in movement, with one technique advising the use of thermal imaging to assist in verifying what elements in sight require to be tracked.